Something is happening in the sports industry. Live viewership has been drastically declining, it runs off a distribution model that’s firmly stuck in the past and the dominant companies are slow to implement technological innovation. It took years for FIFA to finally use goal-line technology during matches, and the NFL still doesn’t allow teams to post replay content on social media. Unsurprisingly, a 2017 report by PWC says the sports industry ripe for disruption — but what could take its place? Even if you’re not into gaming, it’s hard to deny the popularity of esports. Viewership is increasing year over year, there’s constant experimentation with new revenue models and it’s redefining the way we engage with online content. It’s a fresh, digitally native take on watching competitive sports, and it’s here to stay. Hundreds of games are streamed on platforms like Twitch every day. The most-watched games, like Dota 2 and League of Legends, generate 60 to 70 million viewed hours per month — even excluding China’s massive streaming platforms. These are huge numbers, making it hard to understate the importance of game streaming in today’s media landscape. Amazon saw its potential early on, making a smart acquisition by scooping up the company for $970 million in 2014 — with more than 15 million daily active users, it’s now the leading live video streaming website in the world. 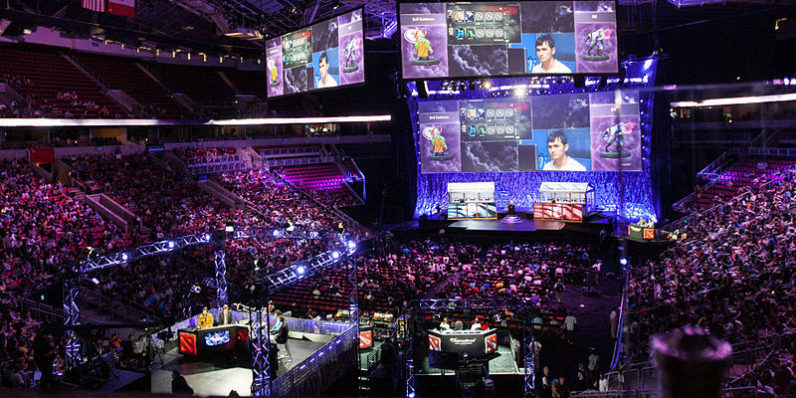 A large part of the current growth of esports can be attributed to a lower barrier to entry. Six out of the ten most-watched games on Twitch are easy to play — all you need is a decent computer or gaming console and an internet connection. This way, fans can play the same games as their streaming idol, which makes for an increase in audience engagement. There are many more ways in which esports is breaking new grounds for interactivity. During tournaments, mixed reality visuals are used to bring the characters to life and create a futuristic, immersive experience for viewers. But it gets even better when players are casually streaming on Twitch. Thanks to the embedded chatroom, fans are in direct contact with their idols and can send them messages or donate money. In turn, the player shouts out some of the viewers and their comments, solidifying the connection between them. Integrating these new technologies into esports comes naturally to the platform. Because of its inherently digital nature, adding virtual reality or live chat feels like a logical extension of the experience, not something that’s tacked on for the sake of innovation. While the business models behind the traditional sports industry are inefficient and stuck in the past, esports are backed up by a completely new way for companies to make money. While some games are paid, others are free to play — including some of the most-played ones like Dota 2 and League of Legends. These games make money by selling competition passes or extra downloadable content like new storylines, characters or outfits. The last has proven to be particularly lucrative — in 2016 alone, Dota 2 and LoL made a combined $1.96 billion off these microtransactions. This new kind of relationship between players and the games is interesting — because players are asked to pay to play, it makes the game operate like a service. Players are free to stop playing at any time, which puts pressure on the companies to continuously improve their experience and make it worth paying for. With lots of titles to choose from, development studios are waging a battle for consumers’ eyeballs — one that continues outside of the game. By releasing free content related to the in-game story, like comics and videos, they try to keep players engaged and keep them paying and playing. Another business model used in esports is an even better example of the industry’s ability to innovate. When taking part in a tournament, players can buy a so-called Compendium. This gives them access to all kinds of benefits, like being able to predict other matches and adding special weather effects or sound packs to their own. These often cost around $10, of which 25 percent is used to create a prize pool for the tournament’s professional players — a crowdfunded grand prize of millions of dollars that benefit all parties: amateur players, professional players and the game company. Esports has better engagement, more room for growth and is much more innovative than regular sports — but why can’t they do the same? As it turns out, there are various things holding back the industry. Most importantly, the large corporations behind competitive play like FIFA and UEFA are being paid copious amounts of money by cable companies for the rights to broadcast matches. As this revenue stream is extremely important to them, they’ve become too scared to innovate, eating the dust of newer companies. At the same time, viewers are already moving on from watching televised sports to new forms of entertainment like streamed games. There are, however, a couple of opportunities for the traditional sports industry to keep a hold of the throne. Just like the cable providers, big tech companies like Facebook and Amazon have recently started bidding for the rights to broadcast matches. It’s very well possible that they’ll end up winning at some point, which might might force the old-school organizations to actively pursue innovation. Another possibility could be that the sports organizations themselves try to figure out a new business model based on the things they already have. One of their most valuable assets could be sports data — while it’s mostly ignored today, it has lots of exciting opportunities. There’s player movement, game statistics, tournament history and much more that could be combined to create new experiences, like developing a fantasy league that pulls in live data, or publishing a mobile game that uses it in some way. These new revenue streams could potentially change their position in the market, but only if they’re willing to take the risk — something that could prove to be hard, if not impossible for large, traditional organizations like these. A great example of a traditional sports company that’s actively rethinking its strategy is the NBA. By allowing instant sharing of all broadcast content on social media, it’s breaking new ground in the industry. These posts are often shared thousands of times, amplifying its reach to many more people than just those watching on tv. The effects on its business have been staggering. Last year, the league broke its all-time attendance record with over 22 million people attending the games. TV viewership rose by 19 percent, while subscriptions for the digital access League Pass increased by 10 percent. On top of everything, the website saw a 27 percent increase in visitors — all things considered, embracing innovation has definitely paid off.